As E3 this week in Los Angeles, SEGA Networks announced the development of Sonic Jump Fever, the company’s latest Sonic game for mobile devices. The upcoming free-to-play game is based on the original Sonic Jump which was released on smartphones in 2012, and will see players setting high scores while competing with friends. In Sonic Jump Fever, players earn the best scores possible in vertical jumping challenges. Users can play as Sonic, Knuckles and other franchise characters during each game, and will need to avoid obstacles, bounce off of platforms and collect rings to achieve the highest score possible. Each game offers “boosters, upgrades and unique character abilities” for triggering huge point combos. In addition, Fever Mode will allow players to go into hyper-speed for even higher scores. Through it all, players compete for the top spot on the leaderboard, which resets twice a week. 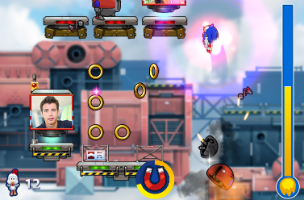 Sonic Jump Fever is in development at Hardlight Studios, SEGA Networks’ internal mobile development studio, and is set for release this summer on iOS and Android devices. Check back soon for more.